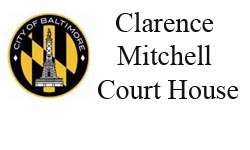 Parking.com offers convenient jury duty parking for the Clarence Mitchell Court House. Click on the map shown to find nearby parking.Online reservations are available for select locations. To pre-purchase guaranteed parking, simply click on the 'RESERVE' button next to the location name. The Clarence Mitchell Court House is conveniently near the Peabody Institute, Baltimore School for the Arts, Contemporary Museum, Enoch Pratt Library, University of Maryland-Baltimore, 1st Mariner Arena, Hippodrome Theatre, Oriole Park at Camden Yards, Baltimore Convention Center, USS Constellation, Historic Ships Museum, National Aquarium, and many great choices of hotels and both fine and casual dining.